Tough decisions will have to be made later this year by City Council regarding day care operations. City staff from various departments will compile reports and recommendations for Council to consider in the wake of cuts to subsidized child care spaces. At its regular meeting Monday, Council was told $885,000 in child care funding will be cut as of January 2015 because of cuts from the Ministry of Education. Because of that, the Sault Ste. Marie District Social Services Administration Board (DSSAB) child care services will be funded differently. All DSSABs in Northern Ontario are facing cuts. In the Sault DSSAB’s system, 61 subsidized child-care spaces will be cut. 19 subsidized spaces will be cut at the City’s Jessie Irving and Maycourt child care centres, the other spaces from other day care centres within the Sault DSSAB system. The cuts come at a time when the need is certainly there, as Council was told Monday there are 1,044 children on the City’s list of children needing subsidized child care spaces. 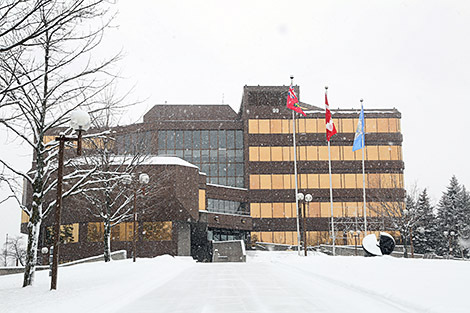 Chief Administrative Officer (CAO) Joe Fratesi said that as City staff go about preparing their reports for Council’s consideration, Council will not have to make a decision on how to deal with the cuts for the 2014 budget, but will have to do so later in the year. The Sault DSSAB has used one-time provincial mitigation funding to offset the cuts since January of this year. The new funding formula will see cuts of 13 percent to 27 percent, beginning April 1 through to January 2015. Fratesi told Council it will have to decide whether the City should stay in the day care business, deal with the loss in funding as best as it can, or bring in the private sector to take over the operations. City Commissioner of Social Services Mike Nadeau told Council efforts are being made to lobby the provincial government on the matter. Staff recommendations are expected to be made to Council in May or June.